134 pages | 14 B/W Illus. We live in atmospheres, we talk about them and we move through them. They offer us an important route into comprehending several aspects of human life and experience, what is important to people, the environments life is played out in, and the processes of change and possible futures. Atmospheres are an ephemeral yet inescapable element of our everyday experiential and conceptual environments. They are continually beyond our grasp as they undergo constant transformation. By interrogating atmospheres, this book arrives at new ways of thinking about the relationships between people, space, time and events. Atmospheres and the Experiential World explores the ways we engage with these affective modes, and the possibilities they offer for researchers, designers and policy-makers to make and intervene in the world. Chapters propose an approach to atmospheres that is not fixed to certain forms or boundaries. Instead, this book argues that atmospheres should be conceptualised as dynamic and changing configurations that allow analytical insight into a range of topics when we think in, about and through them. 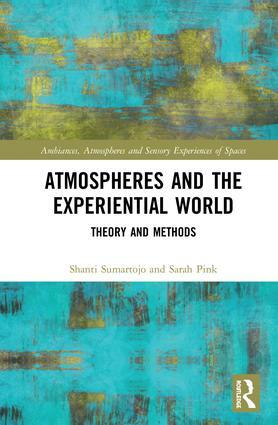 This book offers scholars, designers and creative practitioners, professionals and students a research-based way of understanding and intervening in atmospheres. Shanti Sumartojo is a Vice Chancellor’s Research Fellow in the School of Media and Communication at RMIT University (Melbourne, Australia). Her research investigates how people experience their spatial surroundings, including both material and immaterial aspects, using ethnographic and practice-led methodologies. With a particular focus on the built environment and urban public space, this includes ongoing work on memorials and commemorative sites. She is author of Trafalgar Square and the Narration of Britishness (2013), and co-editor of Nation, Memory, and Great War Commemoration (2014) and Commemorating Race and Empire in the Great War Centenary (2017). Sarah Pink is a Distinguished Professor in the School of Media and Communication at RMIT University (Melbourne Australia). Her research, based in design anthropology, focuses on design for wellbeing and emerging technologies, often through interdisciplinary collaborations with designers, engineers, artists and scholars from other disciplines. Her recent publications include the co-authored books Uncertainty and Possibility (2018) and Making Homes (2017) and the co-edited books Anthropologies and Futures (2017) and Theoretical Scholarship and Applied Practice (2017). Research on ambiances and atmospheres has grown significantly in recent years in a range of disciplines, including Francophone architecture and urban studies, German research related to philosophy and aesthetics, and a growing range of Anglophone research on affective atmospheres within human geography and sociology. In what ways do ambiances and atmospheres play a part in the unfolding of social life in a variety of settings? What kinds of ethical, aesthetic, and political possibilities might be opened up and cultivated through a focus on atmospheres/ambiances? How do actors such as planners, architects, managers, commercial interests and public authorities actively engage with ambiances and atmospheres or seek to shape them? How might these ambiances and atmospheres be reshaped towards critical ends? What original forms of representations can be found today to (re)present the sensory, the atmospheric, the experiential? What sort of writing, modes of expression, or vocabulary is required? What research methodologies and practices might we employ in engaging with ambiances and atmospheres?